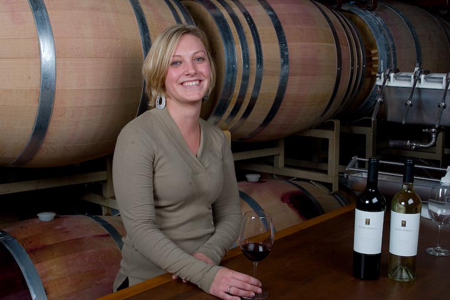 CHELSEA BELLOWS has one of the coolest jobs as Director of Operations for the Alpha Omega Winery in Napa Valley. 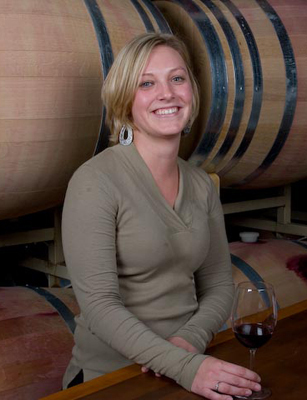 She oversees the day-to-day operations for the vineyard, as well as educates the masses about quality wine making and the prestige of the AO brand. Several of you have written about being intimidated by wine, so I thought I would toss out a few questions to a friend who happens to be an expert on the subject. However, much like when you start talking with your girlfriends, our conversation veered from how Chelsea landed her unique job, to wine tips, to how to enjoy Napa Valley and, of course, her current beauty obsessions. First, when did you decide on a career in the wine industry? To be perfectly honest, I feel like the wine industry found me, rather than me pursuing a career in wine. I worked full-time in the restaurant world to pay for college, so I learned a lot about how to run restaurants. Restaurants need to be well-oiled machines from the hospitality, to food, to beverage management. Once I graduated from college, I knew I wanted a career in marketing, but I was not exactly sure what I wanted to do. So, I decided to travel through Europe and the one major thing I took from the trip was a better understanding about the culture of food and wine. For one thing, I learned that people actually do slow down to enjoy time with their family and friends. Being from Los Angeles, I’d never experienced that. And I learned that I had a passion to learn more, so when I returned to the U.S., I moved to Napa and started working in a tasting room to pass time until I decided what I really wanted to pursue. Once in Napa, it was like fate…I packed up my stuff and moved on a Wednesday, applied for a tasting room job that was set to open that Friday and started work on Monday. I even started in the tasting room at Alpha Omega, but I soon realized that I had the opportunity to be apart of a growing business. So, I took on every possible task so that I could learn more. I learned how to make wine, but I also learned about the business and hospitality side of the industry too. Five years later, I’m following my two biggest passions–business and wine–and I love knowing that I will never know everything about wine. 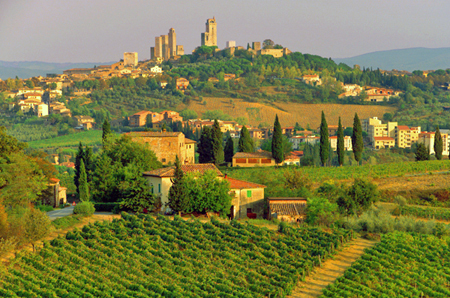 The wines, the regions, and the various styles of wine making are endless. Any advice for someone who may want to pursue the same path? The advice I would give is to just take the leap, keep it simple, open your mind and absorb everything like a sponge. Wineries are not only farming, but manufacturing and many of them are small family run businesses, so they are always looking for interns. When I was starting out, and even still today, I ask a million questions. There are so many moving parts that sometimes just listening to people who know what they are talking about helps more than you think. So, take the leap and remember that most people in the wine industry in Napa came from somewhere else. And keep an open mind because so many people have a pretentious attitude about food and wine, it’s something I see a lot and it’s really too bad because realistically, it is just wine and we are not curing cancer. What about folks who are intimidated about wine? Wine is fun and you should remember that everyone who appreciates wine now started in the same place as you in terms of how much they knew. How can a beginner learn what type of wine they like best? Wine is about your taste and the best way to learn is to experiment. It’s important to just believe in your own taste, if you like White Zinfandel…more power to you! Everyone starts somewhere. With White Zinfandel as the example, ask yourself, do you like it because it’s sweet or do you like the color? 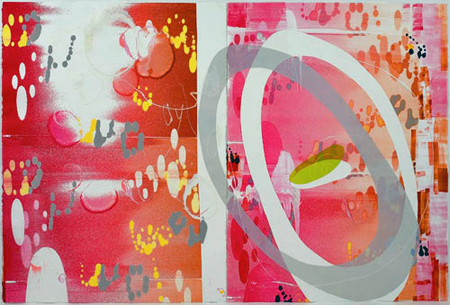 Once you pinpoint why you like it, then you can start exploring other styles that have the same components. For instance, if you like Zinfandel because it’s sweet, then you’ll probably like German Reislings which can have a sweet character, but its high acidity keeps the wine clean and fresh. From there you can try a fruit forward Sauvignon Blanc. If you like Zinfandel because of the color, then try a dry rose from Bandol and imagine an afternoon in Provence. What about learning to describe wines? I always struggle with that. You don’t need fancy descriptors, one of my favorites that I heard recently from a winemaker was “spring wind”. I mean, really. If you like a wine just figure out why you like it. Once you know that, go to a local wine shop and talk to the staff and tell them which wines you like and what price range you are looking for and they will lead you in the right direction. I travel all over the country and see how eager these local wine shops are for customers who want to learn about wine. They want to share the wine drinking experience and once you get them started, it will probably be tough to get them to stop. How do you know when a wine is great? First of all, a wine is not great if you don’t like it. Taste is personal, so trust your palate, but try to get beyond “I don’t like it”. It is more important to think about why you don’t like it. Are the tannins on the Cabernet Sauvignon too sharp? If so, try a Pinot Noir from Oregon. Another point to make is that sometimes wine develops cork taint which actually turns the wine bad. It comes from a bacteria, TCA, which is in 2-5% of all corks and inevitably one day you will open a wine that is corked. Corked wines have a very distinct smell, think wet newspaper or cardboard. So, if a wine has that smell, take it back to where you purchased it and asked them to switch your bottle. What’s the proper way to store wine, especially if space is limited. When I first moved to Napa, I lived in a small studio apartment and I found the easiest way to store wine was on a rack. You always want the bottles to be stored in a way that keeps the cork moist, so you can either keep the bottles in a closet in a cardboard wine box with the cork upside down or on a rack on their side. I enjoy keeping my wine on a rack for decoration because it’s a good conversation piece. The one major component of storing wine is you must keep it away from the heat! Heat is the worst and it will ruin your wine. And if you see the cork pushing a bit from the bottle, throw a party and consume the wine right away because that wine will not age. So, in my studio apartment, I kept the early drinkers on a wine rack and set my thermostat to 75 degrees to keep my apartment cool enough so the wine wouldn’t spoil. I eventually invested in a 50 bottle wine fridge to keep the wines I wanted to hold and age at the correct temperature which is around 55 degrees. What is your favorite wine to serve at a dinner party? If it’s a celebration, I usually select a sparkling wine from Domaine Carneros. If I am getting together with friends for dinner, I ask what’s on the menu and I bring something that people have not tasted before. The most recent wine I served for my best friend was a 2006 Syrah from HDV. What about wine for gifts? I try to make a connection with the wine and the person. For instance, my Dad loves Napa Valley Cabernet, he has it coming out of his eyeballs, so every birthday I get him Cabernets or Bordeaux blends from different parts of the world to show him the different styles. 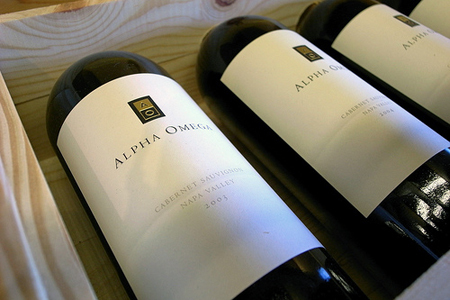 But when I’m not sure what to give, I give a bottle of our Alpha Omega. What do you recommend to people visiting Napa for the first time? First, I think people try to fit too much into a day when they visit Napa. People forget that even though it’s wine tasting, by the time they hit 7 or 8 tastings, they’ve been drinking all day long. 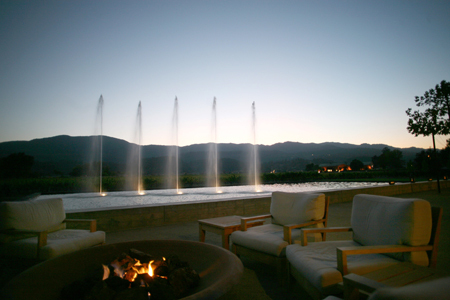 When appointments are stacked one after another you never get to relax and feel what’s really special about Napa. It’s wine country, so you need to get on “Napa time”, slow down and enjoy the Valley. I can talk wine all day, but talking about myself is more difficult. I’m very laid back, but I can also be fun and spontaneous. Over the years, I’ve found that I am more of a control freak because I come from a family of non-planners. So, I do plan things like dinner reservations, but I am definitely a go-with-the-flow sort of gal. As for my style in regard to fashion, I love reading fashion magazines and staying up on the current trends and I shop quite a bit. I would say my style is classic. My latest must-have essentials are a cleanser, moisturizer and night cream with glycolic acid as the active ingredient. I’m young, but I still see wrinkles and I’m not sure how to react to them. But since I started this new regime, my face feels softer and more revitalized in the morning. My other essential is Burberry perfume. In the wine industry, it’s taboo to wear any sort of perfume because it affects the smell and taste of wine for others around you, so I’ve been wearing Burberry for 7 years now because it is barely there and doesn’t affect anyone, but when I smell my wrist it puts a smile on my face. To relax, I go to the nail salon, I always say that I am going to therapy. I love getting pedicures especially because living in California, sandals and peep-toe shoes are in our wardrobe all year round. And I love having a nice manicure, so I’ve started getting gel nails which last 2-3 weeks. I would say my true style inspirations are the people I see at the winery everyday or during my travels. I’m a huge people watcher. I enjoy seeing how people style themselves on their own without them having a stylist, hair stylist and make up artist at their fingertips. A great meal and a great bottle of wine with the people I love. What song takes you some place special whenever you hear it? Red, Red Wine by UB40. I’m kidding, Yolanda! I agree with you, it is pretty amazing how music can change your mood or amplify a feeling. So, I listen to alot of music and I love finding new artists and discovering new sounds. The one song that does move me every time is Shiver by Coldplay. Everything happens for a reason. As long as you work hard and push yourself to do what you love in terms of work, you will succeed. And if business is not what you are looking for, then have courage and passion in whatever you decide to do including family. But it’s important to try new things and get outside your comfort zone because that’s when you truly learn what you are capable of and what makes you happy. A Love Story of Food and Wine. Photos: Alpha Omega Winery, Napa, California.